Yellow Striped Ruffle Sleeve Tee – $24.99 – This tee is really simple but has a little extra something to it when you add the sleeves on, but it’s still not super out there and I really like that. This also comes in other colors and the option is always nice. Mid Rise Linen Striped Cotton Pants – $39.99 – These are a little bit on the pricey side of things but I love the way these look, they just look really comfortable and like they would go with so many things during the spring and summer. Blush & Clear Lucite Hoop Earring Set – $20.00 – I don’t know what it is but I have been super into hoops recently, I have been snatching them up and wearing them left and right. These are so simple but they are so cute, I especially love the blush shade in this set. Rib Knit Pastel Sweater – $36.99 – I know, I just said that I was tired of sweaters but there have still been a few chilly days and I love this style of sweater along with the pastel shades, it’s just really cute and comfy. Geometric Resin Hoops – $12.99 – I really love the navy and the lilac ones of these, I also love the shape of these because they are interesting without being too much, which is something that I enjoy as you can probably tell. Also, these fit into that whole hoop thing that I have been loving. Slouchy V-Neck Cardigan – $34.99 – I love how soft and plus this looks and I really love the pastel yellow of it, it looks perfect for the spring time if you ask me. This one also comes in other shades and gives you a pretty good option of colors. Bee Kind Tee – $14.99 – This will be making its way into my wardrobe at some point, I know that for sure. This tee is really simple and cute, I love the look of it and I love the bee on it. Striped Tie Linen Shirt – $32.99 – This looks like something that I would thrift but I am still attracted to it. I love how lightweight it looks, I love the look of it and the pink stripes are too cute. Boyfriend Distressed Jeans – $34.99 – I always feel like it is unexciting to include jeans in these wishlists, but I really love the look of these because they look comfortable and really cute. Plus, I love capris or rolled up legs for spring and summer. Twill Moto Jacket – $44.99 – Let me be real for a second, I would never wear this, not because I don’t like it but because it just wouldn’t fit with my style, but I still think it is cute enough to mention. If I had a different wardrobe, I would be all over this one. Mid Rise Distressed Straight Jeans – $44.99 – Another boring pair of jeans that I just really like the overall look of. I am not sure if these are too distressed for me, but I do like the look of them. Daisy Print Linen Shorts – $ 26.99 – I have two other pairs of these from last year and I love them, they are very comfortable and easy to wear, while also being cute and breezy. I just really love the color and the little daisy print. Delicately Beaded Hoop Earrings – $9.09 – Another pair of hoops, shocking, I have a problem and I don’t want to fix it because I love the look of hoops. These are really cute and really delicate and a fun pop of color. Hour By Flower Dress in Retro Blossom – $75.00 – I love looking at dresses on Modcloth, I’ll probably never wear any of them but that doesn’t stop me from looking and dreaming. I adore this floral pattern, I love the colors and the design and it’s just really cute. Faux Suede Slingback Flats – $24.99 – I think these are really cute and really simple for spring, I also like that they are dark without being too dark since they are green after all. I think it is interesting while still being easy to work into any outfit. Printed Linen Blend Daisy Shirt – $32.99 – Apparently I really like this pattern because here it is again, it’s just really cute and simple but also fun and I think it will be fantastic for the upcoming warmer months. Fry Your Best Tank – $16.99 – This is a workout tank but I thought this was too cute and punny to not include in this past. This looks super comfy and easy to work out in or just lounge around the house in. Fringe Hoop Earrings -$12.99 – I love the lilac ones of these the most, though I do like the other shades as well. 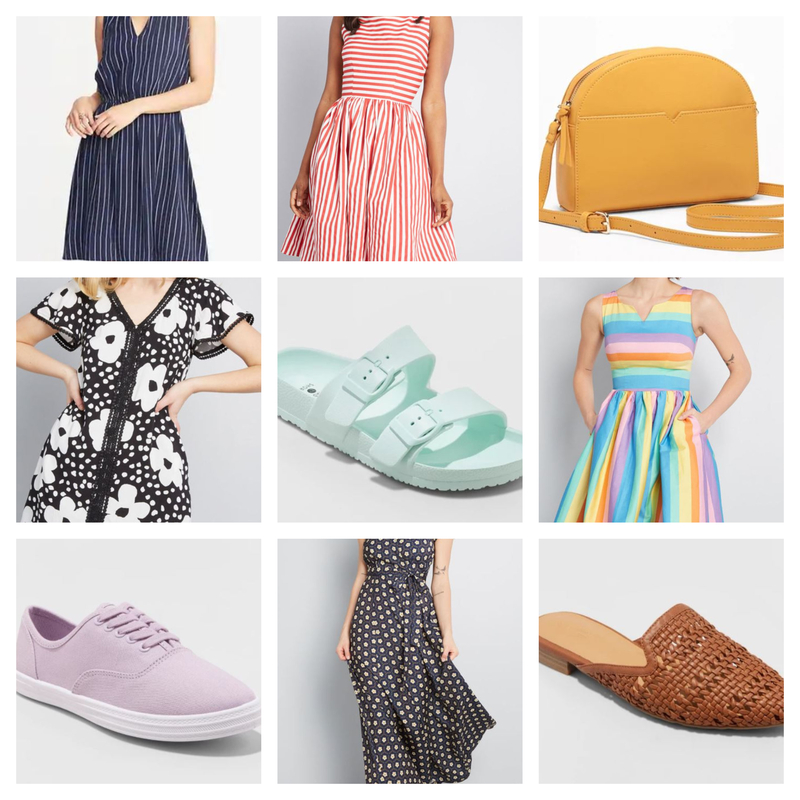 I think these are really fun and trendy and would probably be perfect for summer, even though this is a spring wishlist. Waist Defined Sleeveless Striped Dress – $29.99 – This dress looks really comfy, cute and simple. I also love the color navy, especially during the warmer months, something feels better about wearing navy when it’s warm outside than black. Collectif Start Sleeveless Striped Dress – $75.00 – This dress is really simple but also really cute, I love how structured it looks but also still really wearable and comfortable. I also like that this kind of reminds me of a circus, is that strange? Faux Leather Yellow Crossbody Bag – $29.99 – I love this yellow color, I thought my love for it would die but it’s back again this year and I really love it still. It’s just so bright and fun. Whimsical Wildflower Shift Dress – $79.00 – This dress is probably too short for me to want to wear but that doesn’t stop me from staring at in the internet, it’s just really cute and simple. Neida Two Band Minty Slides – $12.99 – My husband would probably hate these but I don’t care, I think these are really cute and would make for great shoes to just slip on during the warmer months and go, plus I love the minty color of these. Collectif x MC Perfected Pastel Striped Dress – $79.00 – This dress is the embodiment of my pastel dreams, it’s super cute, it’s a pastel rainbow basically and it’s really simple while also being fun and not too in your face. I kind of really want to own this but am not sure that I would wear it enough. Canvas Lace Up Sneakers – $10.00 – These are just really simple, really cheap and cute sneakers. I love the light purple ones and think I’ll pick up a pair for the spring probably. Exchanging Introductions Maxi Dress – $99.00 – This is a pricey dress and yet another ModCloth dress that I probably wouldn’t get enough wear out of, but I love the look of it so I had to include it because it’s so pretty. Woven Backless Slip On Mules – $24.99 – These might have been in a wishlist last year, I honestly can’t remember but I did not get my hands on them last year and they are back this year, so I had to include them because I think they are too cute not to. And these come in wide, which is always nice. 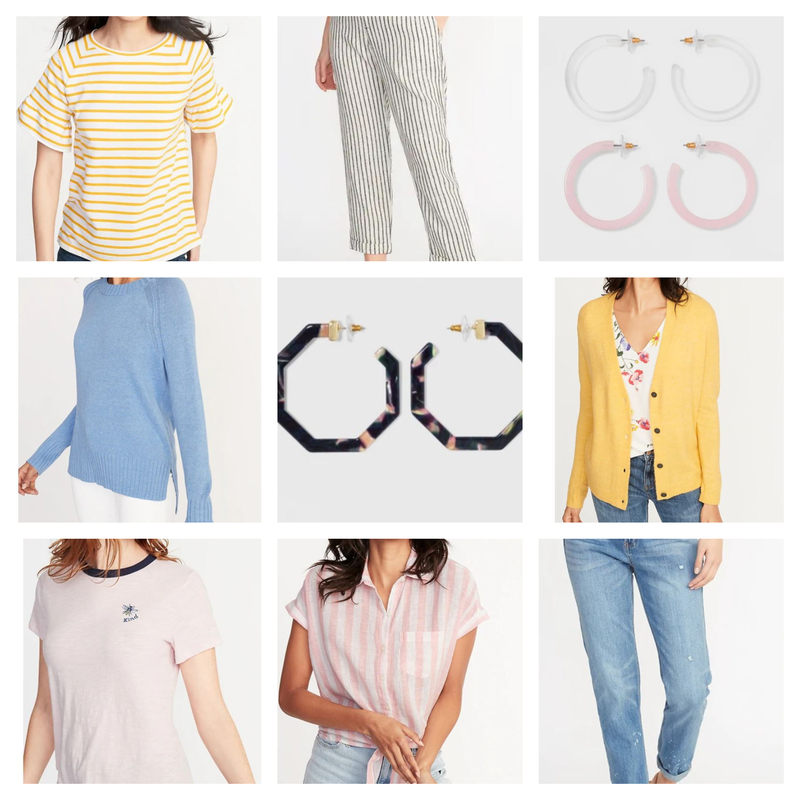 And those are all of the things that I am seriously drooling over as of recently for the spring season, I will probably end up picking up a few items for the season though I do not think I’ll even make a dent in this list because I really do not need any more clothes. 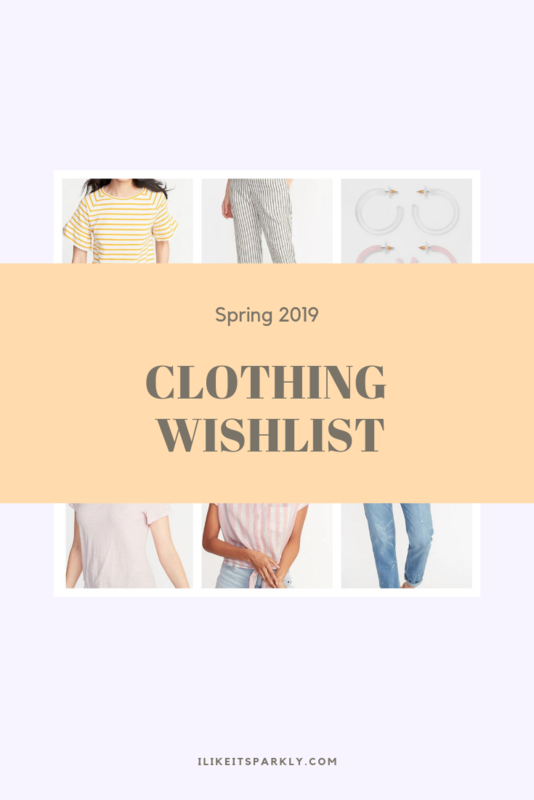 What are some things on your spring wishlist? 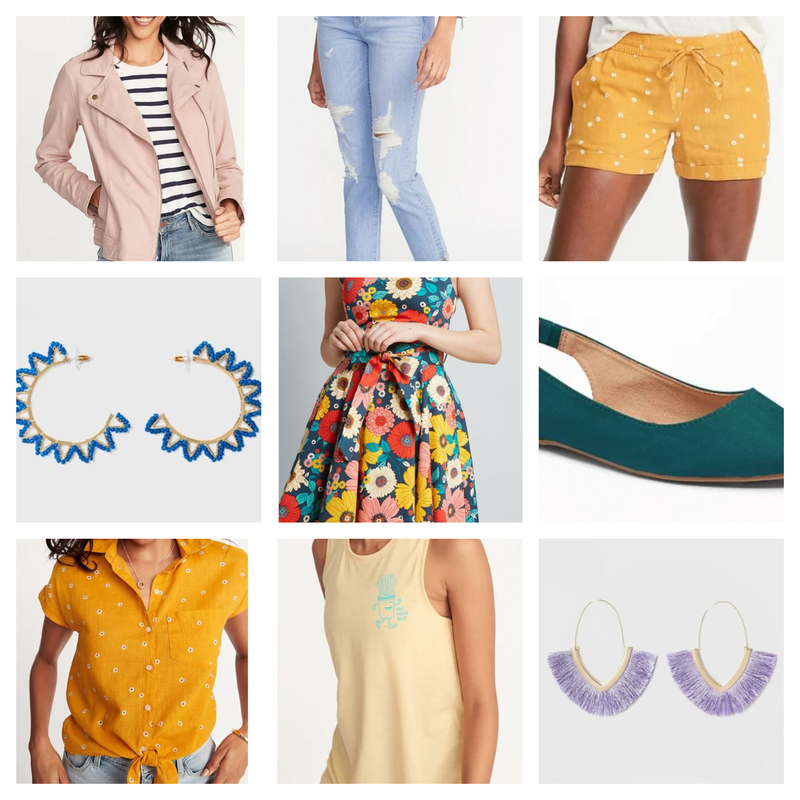 I love those daisy linen shorts, I just ordered some last week! I also love the lavender canvas sneakers; so fun and chic for spring/summer! I ended up making an online order but didn’t get those shorts, the regrets. But I have things to return so maybe I’ll pick ’em up later. I really love that lavender shade, it’s so springy!